Announcing a brand new incentive program, guaranteed to get students excited about piano lessons. Announcing - Piano Karate! This program recognizes and celebrates student achievements and follows my favorite lesson book series, Faber's Piano Adventures. Taking the popular karate belt color levels and applying them to piano lessons guarantees a program that's easy for students to understand and helps them attain a long-range view of piano lessons and piano. There are 10 levels for students to attain, from white belt to black belt. While achieving the level of black belt will take students anywhere from 4 to 8 years, there are many opportunities to celebrate and recognize achievements along the way. Each belt color is broken down into 3 stripe levels, giving students both short and long-term goals. While reading Philip Johnston's book, The Dynamic Studio, I was inspired to create and implement a Karate-style program to assess, support, motivate and celebrate student success. 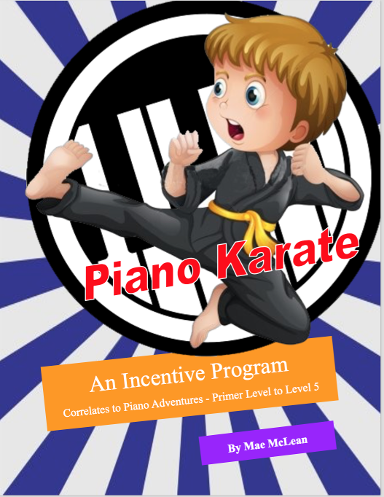 I believe all my students will be fully engaged and motivated with this Piano Karate program and will love all the ways their achievement levels will be displayed. A Piano Karate program book to put in their binders that we will use to assess efforts and mark off when tasks have been completed. Congratulation Cards for each belt color level that they achieve. We will put these into a plastic trading card sleeve in their binder. Students will enjoy looking back and seeing how far they have come! Piano Karate Membership Cards that will be attached to their student bags and from which appropriately colored ribbons will hang to announce the Piano Karate levels students have achieved. A Karate Character to move along a Piano Karate bulletin board according to their level. Student Success Cards will be given to celebrate achievements such as mastering a scale, composing a piece, memorization, practicing, etc. that students can also put into their binders. If you are a piano teacher looking for an easy, yet full-impact incentive program to implement, click here to purchase Piano Karate.